Protecting the stomach lining and reducing discomfort associated with acid reflux often means using medication that causes side-effects. This is particularly so in the case of proton pump inhibitors which can often prevent production of the stomach acids necessary for calcium absorption; this, in turn, can lead to an increase in osteoporosis-associated fractures. - Plants such as liquorice, marshmallow, plantain or elm are sometimes helpful but the most active nutrient in this area is zinc L-carnosine. Combining the two elements of zinc and L-carnosine in equal parts produces a new molecule with superior properties to those of the two elements separately. - Zinc deficiency leads to changes in the secretion of various cytokines, causing intestinal inflammation, reducing immune defences in the stomach and destabilising cell membranes. 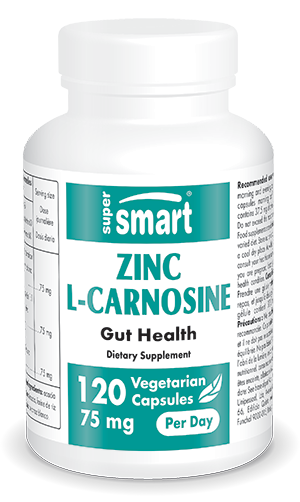 - L-carnosine, which is naturally present in muscle tissue, optimises zinc's effect both by enabling it to reach the site of inflammation or ulceration and by fixing it to gastric mucosal cells. The benefits to tissue are long-lasting. - This zinc L-carnosine combination is a natural, effective and well-tolerated solution to protecting the integrity of gastric mucosa and preventing acid reflux-associated disorders. Each vegetarian capsule contains 37.5 mg of Zinc L-carnosine.